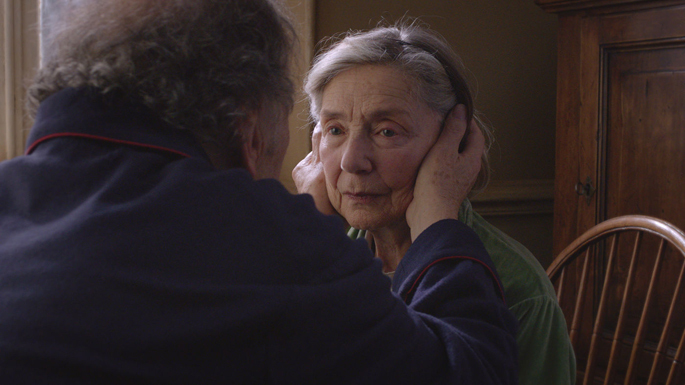 Amour is one of those films you go to because you have to, it's a strange responsibility and one you suspect you owe yourself, but you're not sure why. To desire to see Amour, I think, to actually show up when you know, deeply, what's in store and have no illusions to the contrary, is a form of emotional masochism. Then again, I've long been of the opinion that just about all of Austrian director Michael Haneke's films dabble in a masochist aesthetic. His films are the sort that deny you the ability to passively watch. Resistance is futile in a Haneke film; you will be absorbed. You will be turned, addressed, and trapped inside what's often a cold, strangely frightening depiction of the world. Funny Games, The Piano Teacher, and The White Ribbon all have managed this is particular ways, but none hit as wrenching a note as Amour. It's a film as strikingly beautiful as it is painful, a relentless gut punch that makes you see stars and keeps pummeling you until you're beaten into a weirdly transcendent submission. I hated and loved it, feared it and cried through it*, desperately wanted it to end as soon as it began, spent the hours after seeing it feeling like a fatalistic pile of crap...and yet I must insist you subject yourself to this torment immediately. Amour is the ultimate downer, yes, there are no two ways around that. Haneke's film does not mince words, and its presentation is entirely straightforward: this is a story of love and death, of what love looks like when carried through to death. The set-up is one that filled me with dread from the outset, and if you can make it through the film without wanting to put an end to the future or reminiscing about lost relatives, you may want to find a therapist as soon as possible. In the film, Haneke boxes us into a luxe Parisian apartment and confines us there. We open confronted with the fact of impending decay, aware that this is what will happen, and from there are taken through the sad progression of events leading to the macabre ritual of the opening scene. 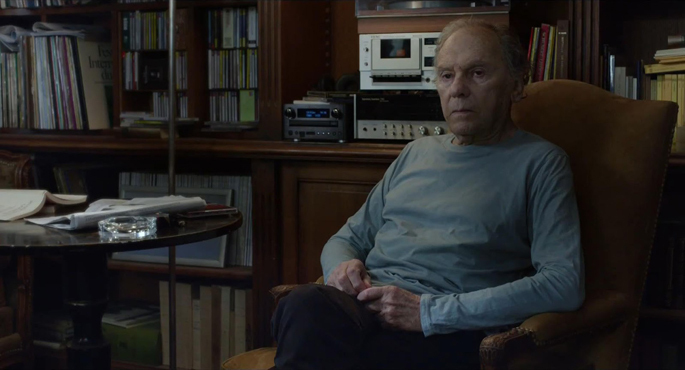 This small world is inhabited by Anne (Emmanuelle Riva) and Georges (Jean-Louis Trintignant), an elderly couple surrounded by the totems of a life lived together. During breakfast one morning Anne freezes, completely unresponsive, only to snap back torturous minutes later with no memory of the incident. It's the first ring in an inevitable downward spiral; a process so deeply affecting because it's so familiar. 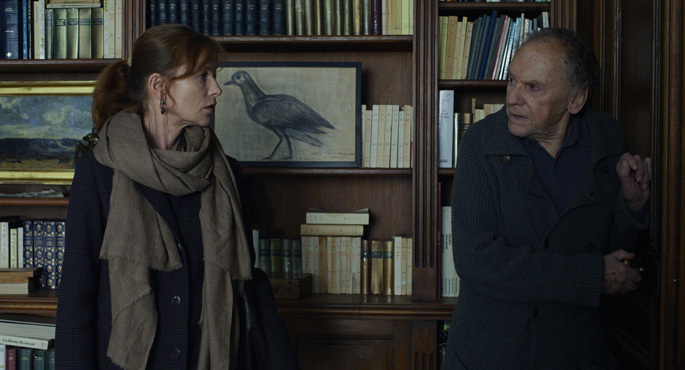 Over the course of the film we will watch as Georges struggles to take care of Anne, as Anne becomes imprisoned by her body, and as their daughter (Isabelle Huppert) flails helplessly at the periphery, not capable of understanding just what's happening in her parents' house. The horror of Amour is that it is what happens, that it happens to everyone. The beauty of it is in the presentation. Amour possesses a placid assurance, a strange calm which -when broken- resonates with a power unlike just about any damn thing out there. There's not a hint of melodrama here, no sentimentality, nothing to latch on to for support or which will allow you to remind yourself it's "only a movie." The score is absent, silent, and music is used only to evoke memory. Anne was a piano teacher, after all, and the silence that follows the loss of that skill weighs down oppressively over each room of the apartment. Haneke shows us something that feels unbearably real. This is an inside glimpse at what it's like to be heartbroken over and over and over again, to feel helpless as death comes rushing on. You will grow to care for these people. You will understand these characters in ways you did not think possible. Emmanuelle Riva delivers an extraordinary physical performance, a regression almost unbearable to watch. She has a face that will make you tear up at the thought of it once you've seen the film, and the fight she shows us could be considered an act of cruelty against those unprepared. Riva, perhaps coincidentally, starred some 50-years ago in what I've previously listed as my favorite sad movie, Hiroshima Mon Amour. She sold it there just as she sells it now, and as bleak romantic leading ladies go, she's certainly been under-appreciated. Here, though, it's the realistic purity of Anne's relationship with Georges that convinces us, and Jean-Louis Trintignant has been snubbed for the Academy Award nomination, certainly. Riva gets the brunt work, but Trintignant has to hold it together. We can gauge Anne's condition through Georges; watch as daily routines become increasingly disrupted, see as contentedness gives way to fear, fear to concern, to hope, to frustration, anger, bitterness, and acceptance. Amour is a thing of terrible beauty. A hypnotic, frightening monster, but a gentle one. Though it may be at your own peril, watch this film. You won't soon forget it. *Note: consider that I don't usually cry in movies, and was recently called heartless for rolling my eyes about Les Mis. Prepare to bawl. **Additional note: no joke, there were only one or two 'groups' of people in the screening. Everyone else in the theater came alone. Why? Because you absolutely will not want to talk to people after this ends. Also, you are probably going to be doing some struggling. My poor eyes hurt for days and I went into it without knowing anything! I just knew, she got a nomination and that was it. Oh, if I had only known, I would have stayed away but this is why I love my absence of the movie world news and trailers and so on, they make me take the chance and if I had not taken a chance on Amour, I would have been a stupid woman! Lovely review and damn, you have a way of words which I will never achieve. Even in my own language. Aw, thanks. I'm glad people are seeing this, thought I can't imagine going into this blind, for some reason (worst surprise ever!). Haven't been able to shake the film since Friday, feel like I probably never will. My mom does elder care for people in their homes and has already crushed my soul with real life stories. All I need to know to get through this is that this couple still loves each other at then end, as implied by the title. Right? Right? Please? Yes, that much is clear, but definitely complicated. Love this movie, love this review. I really think only Haneke could've made this. You're right, it is gentle, but it's also unrelenting. "Unbearably real," indeed.